With the rapid development of high technology, more and more advanced inventions follow one after another. What we must mention is Apple who always devotes itself to making great breakthroughs in human science and technology to better serve digital life. 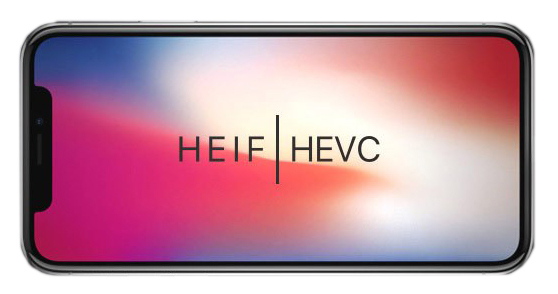 Take a typical example, which is the new camera formats adopted by Apple in iOS 11: HEIF and HEVC. In the short term, you may not be aware of its big benefits and limitation at once. If you even do not make deeper understanding about them, you will never notice what exactly they are and how powerful they work. In short, you will get to know that HEIF and HEVC play an important role in our future life, which is the reason why you should learn more about them to take advantage of their functions well. HEIF is the short form of High Efficiency Image File Format, which is also called HEIC designed for photos. Applied top-leading algorithm, HEIF can cover all kinds of images, including single image, photo bursts and animations like live photos. HEVC standing for High Efficiency Video Coding, also known as H.265, is developed for videos. Compared with H.264, it can offer high-quality video at lower bit rates. Both HEIF and HEVC are industry standard that was ratified by ISO in 2015 and are good at saving files with better compression than JPG and H.264. As a result of taking up less storage spaces, it becomes more acceptable and popular during Apple circle. Accordingly, more and more users pay close attention to these two amazing formats. You can open and view HEIF images on iOS 11 operating system and macOS High Sierra (10.13), which is to say, if HEIF images are transferred to other devices, like Andriod phones, all Windows version, iOS 10 or lower as well as macOS Sierra (10.12) or lower, they cannot be opened with ease. You need to look for practical ways to solve this annoying problem. Better than HEIF, HEVC can be supported by more operating systems, for instance, Windows 10, iOS 11, Android 5.0 or higher together with macOS High Sierra (10.13). Identically, except what referred are Windows 8.1 or lower, iOS 10 or lower, Andriod 4.4.4 or lower and macOS Sierra (10.12) or lower, on which HEVC-encoded MOV video cannot be played. If you have HEIF and HEVC files at the same time, it may be hard for you to distinguish them. Under this circumstance, you can judge them by referring to their files extensions. HEIF image will generate its extension as "heic." while HEVC (MOV video) show its extension as "mov.". To get further detailed information, you can click the "file properties" to see whether it is an encoded one or not. However, a key point you cannot be ignored is that when your operating system is set without showing extensions, you will not be allowed to see an extension at the end of file name. To achieve it, an online cloud server can help you, such as the most famous Dropbox. Only upload files to it, you can see the extension easily. To meet the requirement of new image file format, HEIF can support not only individual image but also a sequence of images with advanced compression code support, of course HEVC in particular. It is also a flexible format that can be used in additional cases. What's more, it can save files up to 50% storage space which is more superior when comes to JPG. Why we here say that HEVC makes great contribution to HEIF? With the industry and Apple support, HEVC is regarded as an ideal codec for both photo as well as movie compression so that it can work with industry file format-HEIF efficiently. Similar to photo app, iCloud Photo Library can upload your photos and videos to iCloud automatically to securely store them once you have finished the shooting. Moreover, iCloud Photo Library can preserve media in its original format, resolution as well as frame rate. Considering HEIF and HEVC are supported with iOS 11 operating system and macOS High Sierra (10.13), they can completely duplicate, view and edit in your iCloud Photo Library that can also display them at a lower resolution. If your operating system is not compatible with it, you will see a warning message. Therefore, it is better to upgrade your system. Having talking about HEIF and HEVC, you certainly have a clear concept about them. As far as I am concerned, HEIF and HEVC are the symbol of the progress of the times. HEVC can be well compatible with and applied to other format in order to achieve better performance. At present, HEIF (HEIC) is common acknowledged to a special exist with high concern from society. You must have meet with some problems caused by it and feel depressed owing to its limited compatibility. However, to accelerate the pace of our technology, it will be developed better and better. Now what you have to do is just to wait for that brilliant moment to come and solve the present problem. Only with a professional converter, you can release yourself from all troubles easily. If you need, Joyoshare HEIC Converter can bring convenience to you. With it, you can convert all HEIC images to other format, like JPG, which with excellent compatibility with almost all operating system, or PNG, GIF, BMP, TIFF and so on. Most importantly, as long as you would like to, you can convert unlimited HEIC images at a time without damaging original quality. If you are interested in it, you can download a trial version.